Rethink it. Rethink what you know about magic. About human history. About what's real and what's myth. The Free Council is questioning everything. Sometimes this leads to new breakthroughs in sorcery. Sometimes this leads to disaster. What it never creates… is trust. • The definitive guide on the youngest of the five Orders of Atlantean magic — a must for any Mage player. 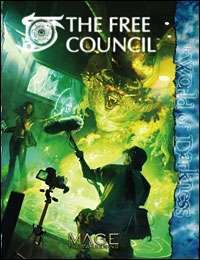 • An insider's look at the Free Council, including unique cabals blending technology and magic, new spells and rotes, and artifacts utilizing both science and magic. • A history of the Free Council and an exploration of the cults, clubs and cells that make up its unusual social structure — and how to tell thrilling stories using it all. This title was added to our catalog on May 02, 2007.